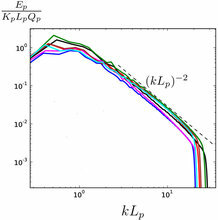 The comparison of the results of direct numerical simulations of isotropic turbulence of Newtonian and viscoelastic fluid provides evidence that viscoelasticity modifies qualitatively the behavior of the smallest scales : we observe a power law in the far dissipation range of the fluid kinetic energy spectrum and we show that it is a robust feature, roughly independent of the large scale dynamics. A detailed analysis of the energy transfer shows that at these scales energy is injected into the fluid flow through polymer relaxation. It is further shown that a part of the total energy is transferred among scales through an interaction of the velocity field with the polymer field.